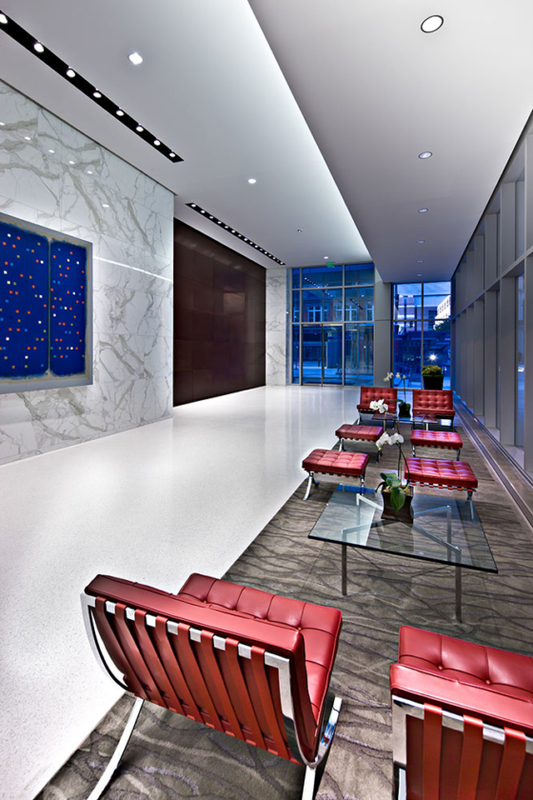 A building’s lobby is said to have the single greatest impact on guests and visitors than any other public area. It will either create a positive or negative visitor experience, depending in large part on its design. 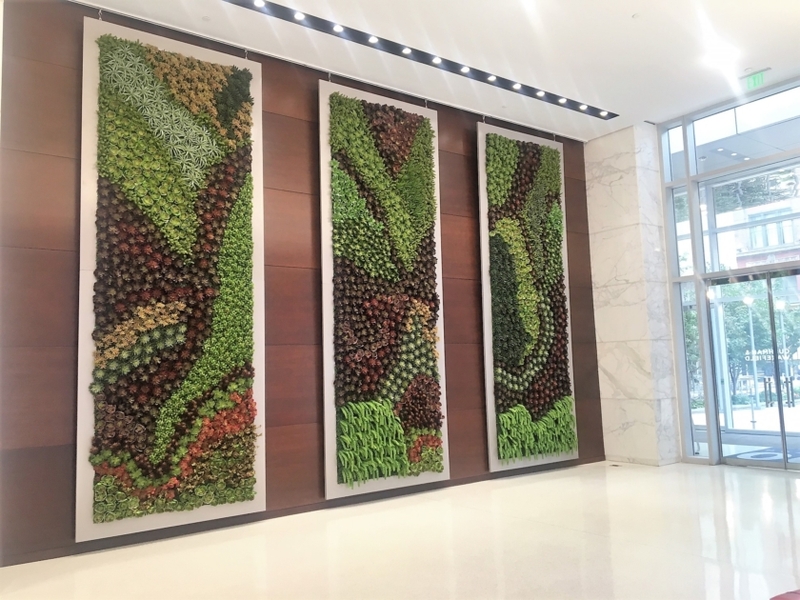 This was likely the thinking of award-winning Ambius designer, and Artificial Plants Unlimited client, Roel Ventura when tasked with designing the lobby of a modern downtown St. Louis office building. 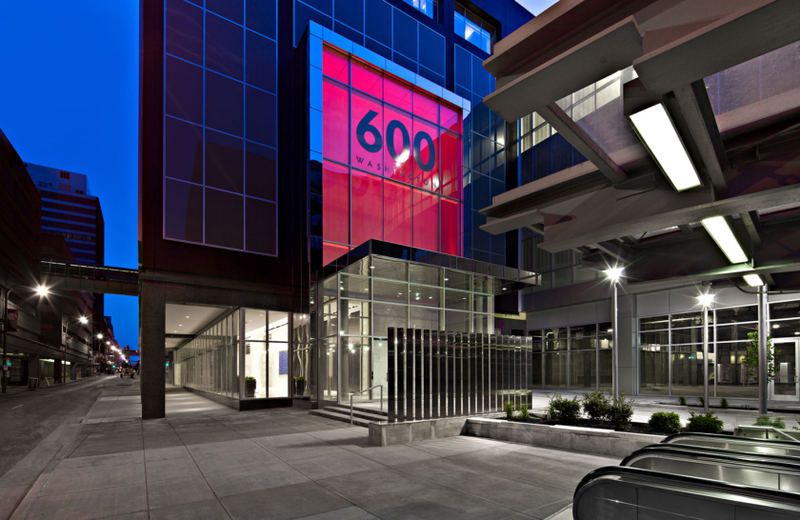 And since this lobby would be visible from the street through floor-to-ceiling windows, it needed to be that much more attractive and inviting to passersby on the bustling thoroughfare. So when Ventura contacted us, we set to work helping him transform the lobby’s bare walls into head-turning masterpieces. Ventura wanted to complement the recently refurbished building’s modern design with an equally modern wall display for the lobby. He wanted replica living walls made in an artistic, original design of our artificial indoor succulents. 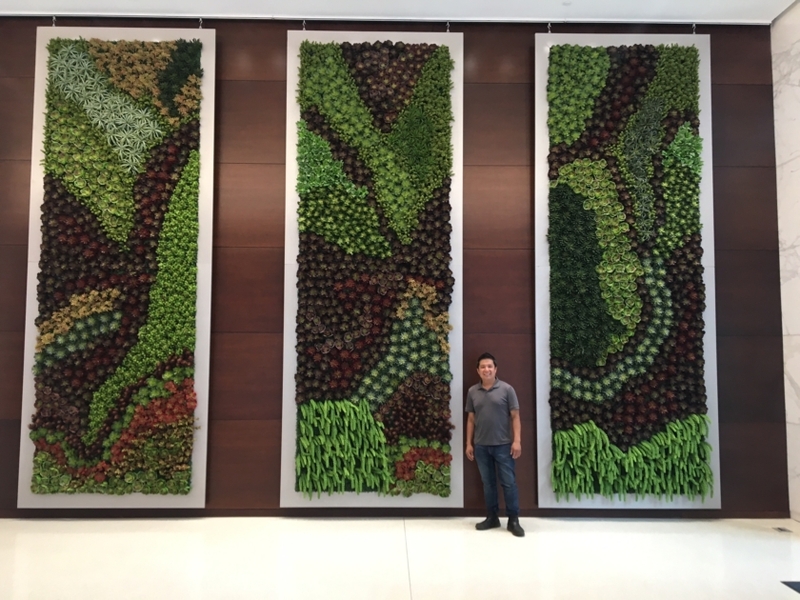 Using different colors and textures of faux plants, including green and burgundy echeveria, agave, and sedum, we created three 16 ft. tall replica wall panels that, when placed together, would create one continuous pattern. 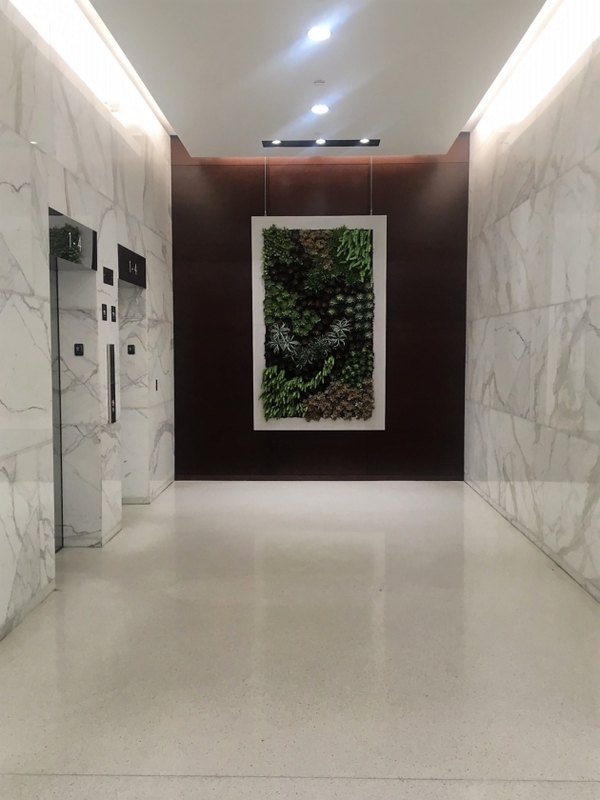 In addition to these panels, we made a slightly smaller replica wall with a similar plant pattern that would be placed at the end of the lobby’s corridor to bring the look together nicely. Part of the draw of an artificial living wall is that you can trust it to retain its beauty and construct without water, trimming, or expensive and time-consuming maintenance. This means no dripping water causing damage to walls and floors, no withering and browning plants, no pests swarming around, and no additional maintenance costs. And, unlike living walls that use real plants, artificial living walls can be placed anywhere—even in hard-to-water areas and places with no light—with no problem. 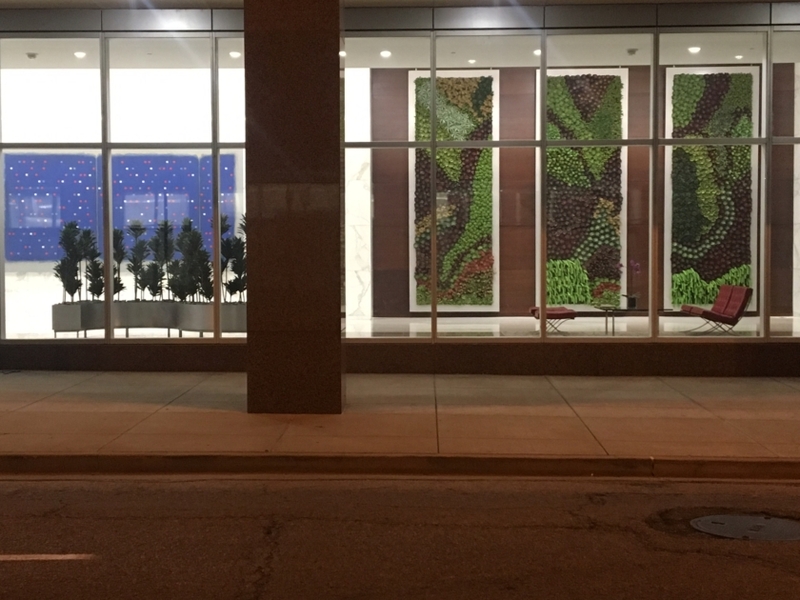 And since, like the replica living wall panels we created for Ventura, are all fully customizable in plant selection and placement, you can create a plant-based art piece you can just hang and forget—no need for trimming, pruning, watering, or picking off dead, withered foliage. Every project has its challenges, but we look at these as opportunities to get creative! Since we couldn’t bolt the panels directly to the walls of the lobby because the walls were covered with panels, we had to come up with an alternative installation method. Our solution? To engineer the wall panels with extra frame supports so that they could be hung from the lobby’s ceiling using cables. We matched the hardware and supports to the silver PVC frames so that it would have a seamless look, giving the impression that the panels were floating in mid-air. Need a Custom Living Wall for Your Next Project? We will help you bring your original living wall concept to “life” with a plant mix design that fits your space—and one that won’t wither, die, or break your budget with maintenance costs. Call us with your living wall design ideas: 1-888-320-0626. Photo credits: Top two photos courtesy of Randy Burkett Lighting Design. All other photos courtesy of Roel Ventura.